The nominations of John Brennan for CIA Director and Chuck Hagel for Secretary of Defense are being held up by Republicans in the Senate largely because of the unwillingness of the Obama administration to come clean on the what the President knew, when he knew it, and what he did during the seven hours that the Temporary Mission and the annex in Benghazi were under attack on September 11th and 12th last year. AIM recently interviewed Retired Admiral James Lyons. He is the former Commander-in-Chief of the U.S. Pacific fleet, and a man not afraid to tell it like it is. We need more men like Admiral Lyons to stand up to the lies, hypocrisy and political correctness that so dominates our national dialogue today. The interview took place the day after outgoing Secretary of State Hillary Clinton’s testimony to Congress, which Adm. Lyons discussed in our interview. It was before outgoing Secretary of Defense Leon Panetta and Chairman of the Joint Chiefs of Staff Martin Dempsey testified before Congress, which raised questions about how in-the-loop Obama was during the terrorist attack, which killed Ambassador Chris Stevens and three other Americans. I asked Adm. Lyons what he thought of Hillary Clinton’s question to the senators when she was feeling the heat from their questions. “What difference does it make?” she angrily asked, referring to how the men died. The questions asked of Sec. Clinton were trying to get an answer to why the administration had claimed for weeks that the attack was in response to an anti-Islamic video produced in the U.S., when records and testimony made it clear that it was a planned terrorist attack on the 11th anniversary of September 11, 2001, and the intelligence community knew it from the first day. During the interview, Adm. Lyons gave his views on what he thinks was going on in Libya at the time; on the “Arab Spring;” on sending F-16s and tanks to the Muslim Brotherhood-controlled Egypt; on President Obama’s new national security team; and on the Law of the Seas Treaty, among other topics. Below are excerpts from the interview. You can listen to the entire interview or read the transcript here. 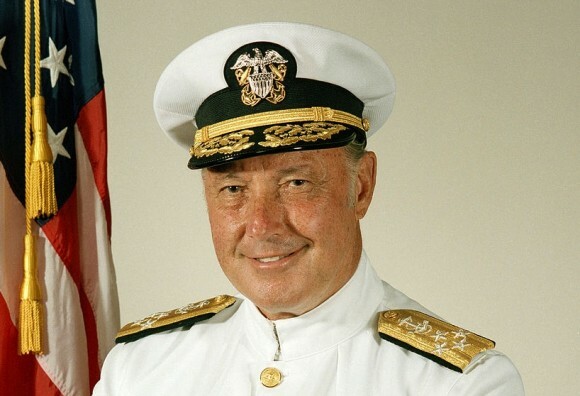 You can read Admiral Lyons’ bio and learn more about his current activities here. ROGER ARONOFF: You have been a persistent critic of how the [Obama] administration has handled the attack on our special mission compound in Benghazi. We’ve had a couple of reports, including the Accountability Review Board, and then, yesterday, we had Secretary of State [Hillary] Clinton’s testimony. Do you feel we’ve gained a more clear picture of what really happened? ADMIRAL LYONS: Not in the least: You’re still getting the smokescreen. I must say that, quote, “Independent” Accountability Review Board, from my perspective, was like having the Mafia investigate a crime scene. ADMIRAL LYONS: Pickering and—[Admiral Mike] Mullen. Pickering, he’s the chairman of the International Crisis Group—which is a Soros-funded group. Plus, with his long career in the State Department, I wouldn’t consider that to be foremost in getting an independent review. What really needs to happen here—and you could see it yesterday in the testimony of Secretary Clinton—you’re never going to get the true story until you appoint a Special Prosecutor, pull in, put the people under oath to find out what actually went on. ADMIRAL LYONS: Right. First, yes, I appreciate the opportunity to clarify because, first of all, I’ve never talked to The Washington Examiner. Where this came up: I was on Lou Dobbs’s show, and somebody must have copied down from that show, maybe submitted a report or something, to The Washington Examiner. Lou asked me, “What do [you] think went on? What [do you] suspect happened?” I said, “Well, if I had to speculate, I believe this was a bungled, a bungled attack—a kidnapping attack, to kidnap Ambassador Stevens, and hold him in exchange for the Blind Sheikh.” You know there’s been a lot of pressure, certainly from [Egyptian President Mohamed] Morsi; that’s one of his objectives, to get the Blind Sheikh released. Now, again, [Dobbs] asked me what I thought, and I speculated, because nothing else made sense to me. We know that Ambassador Stevens was concerned over his safety there. I mean, why would he stay there—first of all, why was he even there on the night of 9/11? You have the significance of the date of 9/11—most places, people hunker down. Then we had a lot of not only tactical, but strategic warning of this attack. We can get into that now, if you’d like. ARONOFF: Yes, why don’t you give us some of that? ADMIRAL LYONS: Let me say, from my viewpoint, there was both strategic and tactical warning. In the previous June, we had both the British Consulate and the International Red Cross close their offices up due to the assassination attempt on the British Consul General, and other assassinations. We had the bombing outside our special mission compound on the 6th of June. On the 16th of August, the cable was put out—“Look, in a determined attack, we cannot defend this compound—” and they requested additional security assistance. They didn’t get any. The day of the attack, the Blue Mountain Security manager, that afternoon, sensed there was something wrong. He put out an alert on both his radios and cell phones. Prior to that, we know one of the policemen who was assigned to guard the compound was seen taking pictures of the inner layout the compound. We found a memo, later, by Ambassador Stevens, saying he found this to be most troubling. We know, according to reports, reliable reports, that road blocks were set up at least three hours before the attack. We know the [Turkish] Consul General, who was the last person to see Ambassador Stevens, had to go through those road blocks…Then there was a British security team that, through prior arrangements, would drop off or pick up equipment from the compound. So there was more than ample evidence, signals—warnings that something is not right, and knowing that [Stevens] feared for his safety, why would he stay there? It makes no sense to me. That’s why I speculated, “Perhaps this was supposed to be part of a kidnapping, hostage situation, holding him in exchange for the Blind Sheikh”: Because killing Ambassador Stevens made no sense to me, since he was the great facilitator in funneling the arms to the rebels, to other militias—many of which were al-Qaeda-affiliated, who had been fighting our troops in Iraq. So why would you kill the golden goose? It made no sense to me. ADMIRAL LYONS: There’s one other thing I’d mention—The leader of al-Qaeda, the day before, on 10 September, put out a video calling for revenge on the U.S. for the killing of a key al-Qaeda leader in Libya by the CIA. When we we’re talking about videos, that’s the video that everybody should have focused on. Not the 14-minute string-up, the anti-Islamic string-up that nobody had ever seen! ADMIRAL LYONS: We had Lieutenant Colonel Wood and his 16-man security force, which was at the Embassy in Tripoli. They were there in August. They had been there for a number of months to beef the security. The ambassador requested they stay, they wanted to stay, yet they were denied and yanked out. The pleas for additional security were ignored, denied. ADMIRAL LYONS: You have to ask yourself, what was the political agenda they were trying to create here? That the Arab Spring has been such a wonderful, great success in Libya? That we can now stand down, and we can rely on the 17th February Martyrs Brigade to provide the security—which, incidentally, has close affiliation with al-Qaeda in the Maghreb? None of this really, if you step back and analyze it, makes any sense. ADMIRAL LYONS: And we can get into what resources could have been brought to bear that weren’t. ADMIRAL LYONS: …All those comforting words that “We don’t want to put our forces at risk.” We had people at risk—they were crying for help! In a situation, you go with the resources you have available—and, in this particular case, we did have that 130-man Marine force recon team sitting there at Sigonella. Even if I only got 50 of them over there, that would have been significant in turning the situation around. We may not have been able to save the ambassador, but we certainly could have saved those other two SEALs that were over on the annex. And there’s another tactic that we’ve used over the years very successfully in dispelling mobs, and scenes like we witnessed there in Benghazi: We had F-16 aircraft that could have been there within a matter of an hour or two. What you have them do is, you have them make a low pass over the scene at full afterburner. It has a telling effect—it really gets their attention. Plus, with the equipment they have in their cockpit, they could have been utilized to take some offensive action—if we had the courage to do so. And there’s another thing here, too. ARONOFF: It’s really incredible. I think the sort of smokescreen that you referred to, that Secretary Clinton was throwing out there yesterday, part of it was “Well, look at what all was going on: All of our embassies were under siege that day, in Egypt, in Tunisia and—” I guess—“in Yemen,” so they were looking at dealing with all of those situations and, I think, suggesting they were just kind of overwhelmed by what was going on, and maybe didn’t act right. This sort of also led up to this scenario where Senator Ron Johnson, from Wisconsin, was asking her about why they persisted in telling this story about the anti-Islamic video that you referred to a few minutes ago. Her answer was saying—she said, quote, “What difference [at this point] does it make” whether it was because it was “a protest or because guys were out for a walk one night who decided they’d go kill some Americans?” So I ask you, Admiral Lyons: What difference does it make? ADMIRAL LYONS: Well, let me answer it this way: Richard Nixon found out what the difference is when you lie to the American public—and in his lie, it was only a bungled burglary attempt; nobody got killed. In this case, we had four Americans murdered. Furthermore, we knew, within a matter of hours, that this was a determined, preplanned terrorist attack. So you have to ask yourself, why perpetuate this lie for almost two weeks? Why did [Clinton] participate in that video—at taxpayer’s expense, I might add—that was sent all around Pakistan condemning the 14-minute stringer anti-Islamic video that nobody had seen? Certainly, with our embassy in Cairo, they had put out their Great Apology the day before, and, really, there wasn’t anybody in our embassy; the Egyptians were able to quickly restore order there. In Libya, you had no such situation: You had, really, no functioning central government in Libya. It’s really in total disarray. The Arab Spring there has fostered a group of al-Qaeda-affiliated militias that have now made available all [Muammar] Gaddafi’s military equipment, much of which we’re seeing show up in Mali, and certainly may have been a part of equipping the group that did the terrorist attack in Algeria. ADMIRAL LYONS: In perpetuating this lie, we also had administration officials lying to Congressional committees. That’s a felony. So, “What difference does it make?” It makes all the difference in the world. You cannot flaunt the truth here, just walk away from it and, basically, tell the American public to stuff it. That’s not acceptable. The point on the organizing the two Marine anti-terrorist teams in Rota, that was good to go ahead and stand ’em up. What I find incomprehensible: The first team, it took them 23 hours to go a few hundred miles from Rota to Tripoli. I could go around the world in 23 hours, so that makes absolutely no sense to me. And the fact that they stood down the second team, which was supposed to go to our special mission compound in Benghazi—the excuse being, “Well, all the Americans are out of there”—makes no sense to me, since this was American territory. That compound should have been immediately secured, and certainly that Marine team was quite capable of doing that. Had they done that, the FBI would have been immediately able to access that scene and gain valuable information. Plus, we would have stopped the looting, and, in this sense, that compound had to have certain classified communications equipment; I can’t believe that they did not have communications equipment—and you have to ask, What happened to that equipment? Who has it today? I know Secretary Clinton made this grand, flowing statement, “There was nothing classified in the compound.” I find that incomprehensible. ARONOFF: Yes, I mean, how do they know? Look, CNN, just walking through there, found [Stevens’s] log book! ADMIRAL LYONS: Yes, of course! ARONOFF: And then, three weeks later, The Washington Post went in and found other things that no one had even touched or picked up. I mean, it’s incredible. ADMIRAL LYONS: What was it they wanted to keep our people from seeing there? ARONOFF: Well, yes, I mean, that’s the question, but they didn’t secure the place to keep reporters from just walking through and picking up whatever they could find. ADMIRAL LYONS: Yes, well, they couldn’t stop the reporters from going in, but they certainly could stop our military from going in. ARONOFF: Right. The question, I guess, is where this goes from here. Let me bring up one other aspect: Frank Gaffney of the Center for Security Policy, and others, have speculated that really what was going on here was that—and you made reference to this—the weapons that we had supplied to the Libyans who were fighting to overthrow Gaddafi, all these weapons, or many of these, were now being supplied to the so-called rebels in Syria—some who were al-Qaeda and all that, so this was sort of a gun-walking—think Fast and Furious—operation into Syria, to other al-Qaeda people, and this is what’s being sort of covered up here. Do you have an opinion on that? ADMIRAL LYONS: Let me put it to you this way: I agree with Frank’s statement there. We know that it was being funded both by Qatar and the Saudi Arabians. What was going on would make Iran-Contra look like child’s play. ARONOFF: Hmm. So where is Congress? Why—I mean, look: The Republicans control the House. Do they not have access to this information? Do they lack—the guts? The vision? ADMIRAL LYONS: I think really what has to happen is, the House has to have the courage to appoint a Special Prosecutor. We still don’t even know how Ambassador Stevens died. You’ve not been able to interview any of the people that were rescued from Benghazi. You’ve got to get these people in, put them under oath, and find out the true story of what went on. Nothing else, to me, is acceptable. ARONOFF: —and Morsi, and we know what he thinks of Israel. The question, the obvious question that hangs over this is, Who are these weapons to be used against? And Why are we doing this? What is your overall opinion of how this Arab Spring is going, and this act in particular? ADMIRAL LYONS: The Arab Spring is a total disaster. We have uncontrolled militias, certainly throughout Libya, Mali. You’ve got, certainly, the situation in Syria. You look at Iraq: Iraq is far from any streaming success. The major weapons systems, the F-16s and the Abrams tanks—the 200 Abrams tanks that are being transferred—all of that commitment was done with [former Egyptian President Hosni] Mubarak. So, to me, since they threw out Mubarak, I would have canceled the deal. Why go forward with it? ARONOFF: I think the theory goes that Morsi played the role of this great peacemaker when he got Hamas to stop [firing rockets at Israel]. ADMIRAL LYONS: Oh, now wait a minute. “Great peacemaker”—Please, spare me! He’s the guy who endorses Hamas! Hamas is a wing of the Muslim Brotherhood in Gaza! It is their group! So this “great peacemaker” is just—pure hogwash! We’ve got to take our head out of the sand. The Muslim Brotherhood penetration in this country is really unconscionable: They’ve been able to penetrate almost every one of our government agencies. You see it reflected down in the administration’s directive, where we have to purge all of our training manuals and instructors on anything that purports the truth about Islam. Anything that is considered anti-Islamic must be purged, and our instructors that don’t fall in line find themselves with new orders elsewhere. We have the Organization of Islamic Cooperation, that our great Secretary of State has endorsed, which impinges on our First Amendment right of freedom of expression, and the administration is embracing this, that we leave it up to the—what is it, 57 or 58 Islamic states that make up that organization—to determine what they consider to be insulting to Islam, and, therefore, they can impose sanctions or bring you to trial, or whatever on this. None of this makes any sense to me. ARONOFF: Mm-hmm. Paper tigers. So today, our posture, in relation to Iran and Israel—first of all, what’s the signal being sent by these arms being shipped to Egypt, as well as the appointments of [John] Kerry, [Chuck] Hagel, and [John] Brennan as President Obama’s national security team? What does this say about our posture toward both Iran and Israel? ADMIRAL LYONS: Certainly, if I were Iran I’d be thrilled to death with those appointments. ADMIRAL LYONS: Because none of them are for taking any military action against Iran, which is giving them clear sailing for the development of their nuclear weapon capability. And it isn’t just their capability in Iran—you’ve got to look at what they’ve done in Latin America. We have Iranian operational missile bases today in Venezuela—fully up and operational. They’ve been able to accomplish what the Soviet Union tried to do in Cuba in 1962. We have cities in the United States today which are under the threat umbrella of those missiles that are in Venezuela. It needs to be addressed. In fact, they should be forced out of there post-haste—“Either take them out, or we’ll take them out.” I don’t see that happening. ADMIRAL LYONS: It certainly cannot be encouraging. I think they’re going to have to look at themselves to become more self-reliant. Regretfully, none of this contributes to maintaining the peace through a strong deterrence. When you show weakness, which we’re doing, it only encourages those who would do us harm. I mean, how many times do we have to go down this path to really come to our senses on this? Here we had four Americans killed in Benghazi—what do we do? Absolutely nothing. There are training camps—we know there are training camps out there that these militias were using; I wanted to destroy them! This idea of “Well, we’ve got to respect the sovereignty of Libya”—not when our people are being murdered—and held under duress. ADMIRAL LYONS: —which are clearly territorial waters! So why would subject ourselves to such a situation? It makes no sense to me. We enjoy—we must—we enjoy and support the freedom of the high seas. We’ve done it since our founding, it is recognized international law, and there’s no reason for us to submit ourselves to a UN council that clearly is against our interests. ADMIRAL LYONS: This, again is the atmosphere, the mentality of political correctness. The Muslim Brotherhood has a plan: It is to institute sharia law in the United States in place of our Constitution—they call it the “Stealth Jihad”—and, in their own words, “to destroy us by our own miserable hands.” And they’re making quite an amount of inroads, as you’re witnessing today.